Today I am thinking about storms, and how we weather them. Scrabbling preparations lead to hours of sitting, reading books, playing board games, and knitting. We wait, and watch Mother Nature have her way outside of these huge windows. We rest. It always amazes me how small I feel, and how grateful I am for my snug house with its warm fire. Before Sandy we picked up everything in the yard lighter than a good sized rock, putting most of it in the shed (poor Shawn, we had just cleaned and organized it for the winter), and covered the scrap wood pile with a tarp, anchoring it to the ground with rebar driven through the grommets. We bought batteries, unpacked the candles, and stood in line at the gas station to fill cans and cars, just like everyone else. I took the outside screens out of the windows and filled 5 gallon buckets and the bathtub with water, while Shawn set up the generator and filled it with oil and gas. We found the extension cords. We made a big pot of soup. I busily did all of the things I learned in a childhood filled with extended power outages. Then the day came. I locked down all the windows, gathered the cats inside, eyed the rotten tree overhanging the chicken house nervously, filled their feeder and waterer… and waited. In the end, we were lucky. We didn’t even lose power, though it did flicker off and on for a few days. We lost some trees, as expected, the screens in the back doors (which were not removable), and at one point a gust of wind picked up the wooden swing set and blew it across the yard. Luckily it didn’t go far, but it was pretty unnerving. Still, we were safe, warm, and fed, and nothing fell on the house or the chicken house. Which is more than most people in its path could say. Did I mention how grateful I am? We took a deep breath, and started cleaning up. That would have been the end of it, and I wouldn’t be writing about it now, except that it got cold here the night before last. The local weather station recorded a temperature of 16.2 degrees Fahrenheit. Yesterday it eeaked above freezing in the afternoon, so I decided to let the chickens out to enjoy what was passing for warm sunshine. I didn’t think it had gotten as cold as it apparently had, because I had a heck of a shock. Three of the roosters had badly frostbitten combs, the water in the waterer had big chunks of ice in it, and the eggs the ducks had laid were frozen SOLID. I felt, and still do feel, terrible. Shawn was away on a business trip to upstate NY, so I gave him a call to see what could be done, as the forecast for last night was supposed to be just as cold. We rejected notions of heating stones or water, as we feared it just wouldn’t produce enough thermal mass, and frankly, we were worried that the silly birds would burn themselves on them. They really aren’t that bright, let me tell you. Also, there was no way NO WAY I would be able to get the generator all the way down there by myself. Long story short, he decided to come home and finish wiring up the chicken house, at least enough so that we could plug in a couple of heat lamps. I immediately decided that it was ridiculous that he should have to come home in the middle of a business trip because I did not know how to run electrical. I decided to rectify this problem by learning how as we did the chicken house together. And I did. Things I learned? Stripping wire in the dark at 20 degrees? Not. Fun. Stripping 6 gage direct burial cable (which apparently means it’s coated with something designed to survive a major apocalypse) without wire strippers under the same conditions? Even less fun. Also, apparently chickens are just as cranky about being kept awake by hammering and lights as I am. And my husband, though amazing in every way, the best dad I know, and a truly brilliant man, really really needs to learn how to use a check list and a project specific parts bin. But we got it done. We staggered up the basement stairs and made pasta with cheese; fat and carbs both sorely needed after our adventure. Then exhausted, and still cold, we dropped into bed. This morning, I awoke, and had no hot water, the water heater having mysteriously switched itself into vacation mode. So I finished the remains of my cold shower, bundled myself into my woolies, and drank my morning tea. All the while, contemplating the fact that my housekeeping schedule has been disrupted by having the breaker for my dryer cannibalized to keep my chickens alive last night (parts bin… all I’m saying), the impending arrival of friends this weekend, and my to do list, which is up above 70 items again. I swear it breeds in the dark. 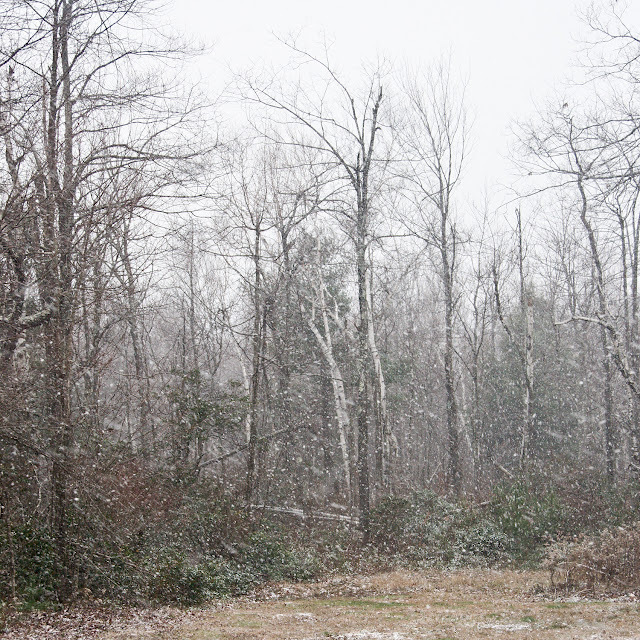 Oh, and the momentary arrival of this season’s first real snowstorm. That’s right. Like most New Englanders this week, I’m looking at the weatherman and saying, “Really? This is a joke, right?” But alas, the snow is here. Thankfully not much, and I don’t think it will stay. But still, all this has me thinking about storms, how we weather them, and how it’s beginning to feel like I go from one crisis to the next as the season takes its final icy turn. You see, I’m tired. Really tired. The last 12 months have been a bit of a marathon for me, what with buying and repairing the house, and relocating my whole life. And we’ve been doing more entertaining than we ever have before. Truly I don’t think I’ve quite got the hang of it yet, but I’m getting there. I’m learning all kinds of new skills, and meeting all kinds of new people. Really, I couldn’t be happier, but I’m just… tired. I am feeling the pull of winter. I am feeling my body and mind slow start to slip into its natural lull. I am looking forward to rest. And as I draw nearer to hosting my very first Thanksgiving, I am realizing what a perfect and natural end to the year it is. I am so looking forward to sharing bounty and thankfulness with some of my extended family. And what better way to end the highly active part of the year than with a big bash? After that, rest, quiet… knitting, board games, and reading books. Shawn is thinking about spending some time with his forge. With the cold and snow coming, I am also coming to the end of my stamina, and as so often happens since I moved here, I find that the rhythms of my heart and body follow those of the world outside my door. I read things written by other farmers I know, and they say similar things; that for them this is the time of year of slowing, of quiet, of turning inward. And as I sit here watching the first flakes falling, I’m marveling at how even wiring heat lamps can drive me closer to living in harmony with the natural world.